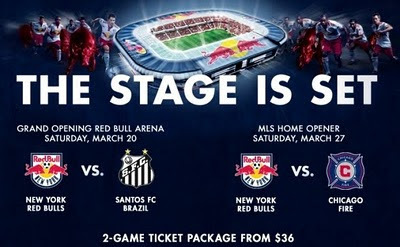 For as little as $36 per person, you can see both the Red Bulls vs Santos friendly and the Red Bulls vs Fire MLS season opener. A pretty good deal! And it looks like Brazilian superstar Robinho will be suiting up for Santos on March 20th. Anyone notice the RB branding on the roof in that ad? I wonder if that is something they are going to add. As a matter of fact, I was wondering the same thing. I guess we'll just have to stay tuned to the webcam.